An enthusiastic team of players from Princes Risborough and Horsenden Clubs (4 men and 4 ladies each) played in the 19th friendly meet. In brilliant sunshine the teams fought it out through the afternoon. 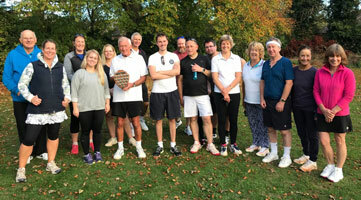 With mens, ladies and mixed doubles being played , and after 15 matches the scores revealed Horsenden remained triumphant. Thanks to Phil Langley, Mick White, Leo Newell, Adam Cayley, Julie Reid, Jenny Thrower, Di Wright , and Susan Shepherd for taking part and representing our club. Thanks to all players from Risborough and Horsenden, including team captain Peter Messenger for making it a fun, enjoyable afternoon. We look forward to next year’s rematch to bring the trophy home (and another nice piccie)!